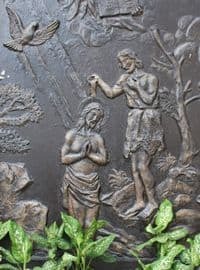 The Baptism of Jesus by John the Baptist marked the beginning of his public ministry, a ministry that lasted around three and a half years. His baptism is one of five major events in his life; the others being his transfiguration, crucifixion, resurrection and ascension. The event is recorded in all synoptic Gospels as is a description of the descent of the Holy Spirit immediately following. The Feast of the Baptism of Our Lord is usually celebrated on the first Sunday (or Monday) after the Epiphany.